Randolph Hokanson, a Seattle-based soloist who studied with Harold Samuel and played concertos with Sir Thomas Beecham, turned 100 the other day. 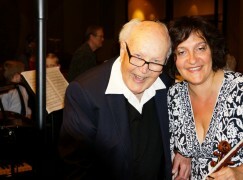 At his party, he introduced and played the late Mozart G major sonata with concertmaster Marjorie Kransberg-Talvi. Watch. It will restore your faith in … everything. Randolph Hokanson was (and apparently still is) a terrific pianist. Maybe not a star but a really fine musician who was the rock of the University of Washington piano program for 35 years. And he looks amazing for 100. I have never heard this kind of playing from a 100 year old! I remember seeing what decline did to Oscar Peterson, though there were probably health issues there too. I know Horowitz was great into old age too. However I think this performance is absolutely great and uplifting! A real tribute to the human spirit. You can buy Randolph Hokanson’s autobiography–With Head to the Music Bent, a Musician’s Story–from the University of Washington Bookstore. The price is $15 + shipping. The link I gave is not working. Then click on the photo of the cover of the book, and the rest will be self-explanatory. In 1965 I took piano lessons from Prof. Hokanson at the University of Washington, and I heard him play in public on more than one occasion. His extensive repertoire ranged from Mozart to Brahms to John Cage. I was delighted to listen to this birthday performance, and I congratulate both him and Marjorie Kransberg-Talvi. She herself is a former pupil of Jascha Heifetz.